(LA GRANDE, OR) – Eastern Oregon Film Festival is excited and proud to announce the dates for its sixth annual event — #EOFF2015. The 2015 festival will kick off Thursday, May 7, and run through Saturday, May 9 in La Grande, Oregon. Save The Date: May 7, 8 & 9, 2015! EOFF is dedicated to bringing the best of new independent film and music to eastern Oregon and promoting a rich cinematic, musical, and artistic experience for our community and the region. Our wildly successful 2014 festival raised its profile and built momentum to insure 2015 will be a landmark immersion in awesome: films, music, participation, and parties. Of course, we thrive on the support of our members. If you aren’t a member yet, then become one now. 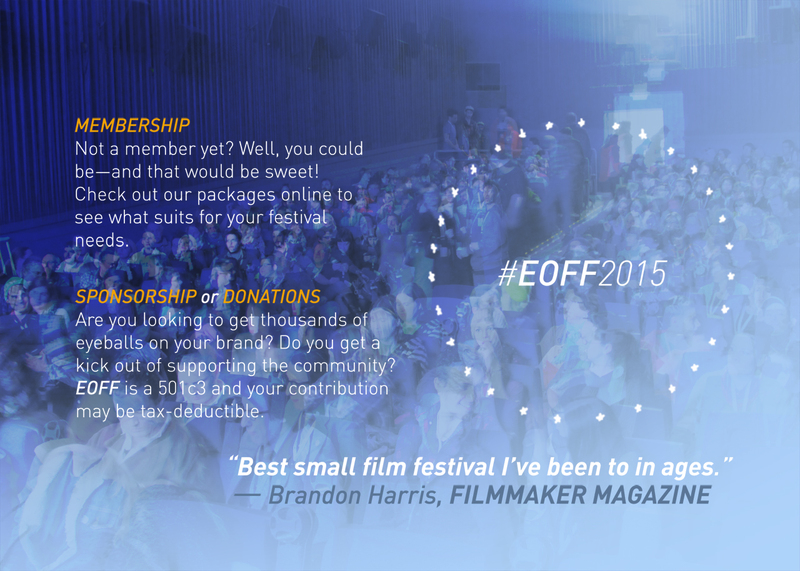 Your support of EOFF is key to the vitality and growth of the festival. Your membership helps bring the best independent ﬁlmmakers to our valley to showcase and discuss their work firsthand; it brings exciting performances by new and emerging musicians; it fires the expansion of our audiences locally and regionally; and it makes sure every after-party rocks. In short, EOFF is fueling a rural cultural renaissance… and you can help. As a bonus, if you act now you’ll lock in the 2014 rate! Become a member today at https://eofilmfest.com/participate/membership. We also thrive with the generous support of our sponsors. Businesses know that partnering with Eastern Oregon Film Festival will increase their visibility and help them achieve their goals. Just ask some of our 2014 sponsors like Terminal Gravity Brewing, John J. Howard & Associates, Brent Wylam Allstate Agent, Ten Depot Street, Liberty Theatre Foundation, Art Center at The Old Library, ArtsEast, Praise Photography, and La Grande Main Street. In short, EOFF reaches customers locally and regionally that will fuel your company’s growth. Learn more at https://eofilmfest.com/sponsorships. Keep #EOFF2015 in mind… after all, our sixth annual festival May 7, 8 & 9, 2015 will be here in no time!